I’ve been struggling over how to begin this review. I want to get it exactly right. I want to convey to you precisely what it is that I mean to say. If you’ve read any of my reviews before then you know that I like lots of stuff. There is, quite frankly, a lot of stuff out there to like. So what I have to do here is convey to you just how this book is, pretty much, one of the best children’s books I have ever read. Here’s an idea. 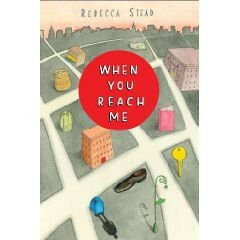 Have you not heard of When You Reach Me by Rebecca Stead? Well now you have. Go read it. Have you already read When You Reach Me by Rebecca Stead? Excellent. Glad to hear it. Now go read it again. Have you already read and reread When You Reach Me by Rebecca Stead? That is fine and dandy news. Have a seat. You and I can now talk about it, and we’ll wait for the rest of the world to catch up. Which they will. Because it is one of the best children’s books I have ever read and books of this sort do not drop out of the sky every day. They don’t even drop out of the sky every year. Now the conundrum. The book is sort of a mystery. It’s sort of a lot of things and if I go too deeply into what those things are, I’m going to give away elements of the plot. This is not something I wish to do for you because the true pleasure of this book lies, at least partly, in figuring out what the heck it is. Is it realistic or fantastical? Science fiction or religious? So I just won’t talk about the end, or go too far into the premise. Therein lies the problem with reviewing a book of this sort. I can’t talk about it without potentially destroying the experience for somebody out there. You can’t imagine the pressure. And I think I can summarize the plot without giving too much away, though. Here goes . . .
It’s the late 70s and the unthinkable has occurred. While walking home, Miranda’s best friend Sal is punched in the stomach for no good reason. After that, he refuses to hang out with Miranda anymore. Forced to make other friends, Miranda befriends the class yukster and a girl who has also recently broken up with her best friend too. But strange things are afoot in the midst of all this. Miranda has started receiving tiny notes with mysterious messages. They say things like “I am coming to save your friend’s life and my own” and “You will want proof. 3 p.m. today: Colin’s knapsack.” Miranda doesn’t know who is writing these things or where they are coming from but it is infinitely clear that the notes know things that no one could know. Small personal things that seem to know what she’s thinking. Now Miranda’s helping her mom study for the $20,000 Pyramid show all the while being driven closer and closer to the moment when it all comes together. When you eliminate the possible all that remains, no matter how extraordinary, is the impossible. The crazy thing is that it’s also the kind of book that smart kids will really really like AND the kind that award-giving librarians will really really like. We aren’t usually so lucky. There’s a kind of broccoli and peas mentality to great works of children’s literature sometimes. This idea that if something is well-written that it can’t possibly be interesting as well. And even crazier than that is the fact that this isn’t going to appeal to just one kind of kid. It’s going to be adored by both boys and girls. By kids who are into science fiction and kids that refuse to touch anything but truly realistic stories. Heck, you could even label this book historical fiction since it takes place in 1978-79. And not the fake 1979 that you sometimes seek invoked in bad television shows and movies either. This is an accurate portrayal of a time period when a person really could spend their days helping their mom prepare for a stint on the $20,000 Pyramid. A time when a girl could be handed books with pictures of spunky-looking girls on the covers… and subsequently reject them because they are not A Wrinkle in Time. Notes on the Title: As I write this review (and this will probably change pretty quickly once the book starts selling in droves) if you type “When You Reach Me” into Amazon.com you will come across other suggested titles as well. Books with monikers like “Wonder When You’ll Miss Me”, “Take Me With You When You Go”, and “If You Really Loved Me.” This is an interesting move on Amazon’s part. It’s almost as if it read the title “When You Reach Me” and came to conclusion that this was a meaningful teenage girl’s novel about self-discovery, boys, and learning how to truly become yourself. Certainly that was my first thought when I read the title. Now through rigorous training and self-flaggelation I have trained myself to memorize this title. Other librarians, however, have some difficulty remembering it, and who could blame them? Aside from this year’s fellow title “Anything But Typical”, this book has one of the most difficult names to remember. It does not zip, nor does it stick in the brain. I suggest that someone quickly write and produce a viral pop song about this book where the sentence “When You Reach Me” is in the chorus, so as to pound those four little words into potential readers’ brains. Promoting great books is difficult enough as it is without having to fight against the words on the cover. Of course, let’s be fair. This was probably an extraordinarily difficult book to name. I know for the fact that this wasn’t the original title either. I’m just flipping through it to find alternate titles, but summing up something this original is hard. “Smart Kid” might work, but it sounds like a flippant cheery tale about a girl who wears cool socks or something. “Bookbag Pocketshoe” might be fun. More memorable certainly. And “The Laughing Man” . . . that’s my favorite. Yep. If I could have named this book I would have called it The Laughing Man. However, my aunt has just pointed out that that was the title of a J.D. Salinger short story. So how about “Lifting the Veil”? Notes on the Cover: A couple librarians told me that they hadn’t picked this book up right away because of the cover. I can see that, but it actually doesn’t bug me all that much. It’s not brown, and brown is always my number one children’s cover pet peeve, so it scored points right there. It’s by Sophie Blackall too and she did that adorable Wombat Walkabout which came out this year. And then there are little clues all over the cover if you look at it. The shoe. The two dollar bill. And a strange image of a mailbox with the shadow of a man without a man. Seriously, I think it’s cute. But no. No child will think to pick it up on first glance. Yet once they start reading they’re going to start figuring out that the objects on the cover are clues to the story inside. So it has things to recommend it. I wonder if some kids will try to work out whether or not the map is accurate. Misc: You must must MUST read this post on Educating Alice. Teacher Monica Edinger read the book aloud to her students and they, in turn, wrote about the book on their blogs. Her post discusses the title, but also links to their thoughts. Want evidence that kids think When You Reach Me is amazing? Look no further. I don’t think it’s fair that you give such a fantastic review to a book that most of us can’t even get until this summer. I hope I remember it in July because it sounds great!! I may have to do an update on my blog when it’s released. Just want it to be on your radar as early as possible, though. BOY, I’m old! You propose the alternate title of The Laughing Man, and the first the first thing that pops into my mind is the J.D. Salinger short story by that name. Wow you sold me on this book. I’m thinking it’ll make a good read-aloud for my nephews. It sounds like a great book for a shared reading experience. Plus it can take awhile to do a read-aloud with my nephews as I don’t have access to them every day (and hence my justification for buying the book). Absolutely. It might be a bit confusing with the backing and forthing for very young kids, but for the older ones it’s apparently a very successful readaloud. Monica Edinger at The Dalton School here in New York has just finished reading it aloud with her kids. When she posts about the experience I’ll be linking that post to this review. And I love the idea that J.D. Salinger and I have similar taste in names. The kids started writing posts today. I should have my post (with the links) up tomorrow. It is a fantastic book to read aloud — I was talking today to a colleague about their teaching in 5th. The tricky thing is that it probably would require all the kids in the class to read it at the same pace — just because of the clues, and threads as they come together. Great to hear! I look forward to reading about Monica Edinger’s class experience. My nephews are 3rd and 5th graders so I think it’ll work great for them. Sometimes my daughter (K) listens in to the books I read to them but more often than not drifts off to something else. I haven’t had much luck finding a book that appeals across that age span (or rather longer books – plenty of picture books that capture everyone’s interest). Well, I think the 5th grader will definitely get a kick out of it. The third grader may find it initially a little too confusing, in terms of how the plot is laid out. I could be wrong, though. Well this immediately went on my wishlist! Thanks for the great review! Thanks for mentioning my “Take Me With You When You Go,” a folk-fairy style chapter book for early elementary. The title is the refrain of a song that runs throughout the book: “Take me with you/With you when you go…” The tune is provided. The blog post is up (at educating alice) with links to the kids’ posts. Wow-sounds terrific. Just added it to my June order. I finished this book last night, after reading your glowing review and then picking up the ARC. It was a compellingly good story, and a perfect addition to our bookstore’s imaginary Tween section (I keep it in my head, with hopes of rifling through it for pertinent customers.). I could see awards in its future. I still can’t get over the cover though, really. I routinely shuffle through our ARC piles to read the back covers, and the description just hadn’t lured me enough to overcome the sort of ebbing beigeness. I can’t quite pick it out to pinpoint it, but it might have to do with the perspective of the objects. I like the illustrator’s style in general, so I know that’s not it. Maybe if it was more of a traditional map? Flatter? Letting you know that these objects were mysterious, and you wouldn’t know their meaning until you read it? Scraps of the note floating over the cover could help. Tell the viewer that this is a Very Mysterious Story. Even just the objects themselves, front and center (like Jeremy Fink’s string of keys). Perhaps the dustjacket illustration just looks too generic coming-of-age, and already dated, but not in a good way. I love how A Wrinkle In Time twines into the story, and could see that incorporated on the cover, too. A centaur? A repurposed 1ed Wrinkle in Time cover, ala Frank Portman’s King Dork? So far, I think it’s going to be difficult to persuade folks to shell out cash monies for this one, unless I’m perched right on their shoulder and explaining in a very emotional manner. I know that retail sales aren’t the be all end all of books, but in my particular realm, it’s all I got. love it that you love the book. it’s got to be good. It was “You Are Here”. Makes sense when you consider the map-like image on the jacket. However, two books came out in 2009 with the title “You Are Here” and one of them was a YA novel. The publisher felt it would make sense to change the title to avoid confusion. Considering how much attention the book has received since then, they were probably right to do so. I am doing a mock newbery class at my school and this is my favorite book. I have read it four times in the last two months. To me, it is like Miranda’s copy of A Wrinkle in Time. But there is one thing I don’t understand. In the end, Miranda says that in the year of the burn scale and the dome, Marcus will come back. So here’s what I don’t get. Marcus has already come back and saved Sal. Why does he need to come back again? His mission has been acomplished. Is it because Marcus needs to know that time travel is possible? I would love to hear any comments or answers to my question. I, am indeed, one of the kids that tried to work out and see if the map works. Let’s just say that some points are random and some points make sense. I can’t go too in detail… After all, I can’t just assume the person reading my comment has read the book. (Though most would have by now- very prompting review) When I started reading it though, I told everybody I knew. What I told them? “If you ever read When You Reach me, which is a great book by the way, you MUST read A Wrinkle In Time or some of it won’t make any sense to you AT ALL. Let’s see if I can explain this: “old” Marcus has already traveled back in time, saved Sal, and died. But “young” Marcus must still live his life, discover the secret of time travel, and eventually go back into his past to actually do the saving. Because if he didn’t, the Laughing Man would never have been there to save Sal in the first place. In essence, by giving Marcus her letter, Miranda is sealing his fate – he knows that he must someday travel back in time and save Sal. He doesn’t have a choice, because he has already seen it happen (he watched the Laughing Man kick Sal to safety). If he didn’t eventually go back, the Laughing Man would never have been there. It’s like the bit about the characters in A Wrinkle in Time arriving before they left. Of course, if the book actually had the character she herself in the broccoli before leaving to save her father, there would have been no suspense because we would know she succeeds in her quest and makes it back ok. I think it could be a scary book when the guy who punched Miranda’s friend Sal started black mailing them. Children will like it but it is a little scary. I am in the minority – I think this book is a rip off of Time Traveler’s Wife – down to transporting sans clothes. I really injoyed the book it was amazing!!!!!!! Just finished listening to the book. I absolutely loved it! I just listened to the book and I’m “Enh” about it. I have not read the other contenders to the Newberry. But right now I’ve got the idea it must have been a pretty weak year. This book seems to lean on Wrinkle in Time as a crutch instead of standing on its own two legs. Wrinkle in Time is a great book, but this book is no Wrinkle in Time. this is a great book.I could not put it down until i was finished. This was a great book! We just added it to our fourth grade battle of the books! I though the middle part of the book was a little slow and I almost stopped reading it, but I am really glad that I finished it…the ending was amazing! The author’s use of second person was an interesting choice and also well done. I agree that the title isn’t memorable, but I also think “The Laughing Man” might give too much away. I absolutely loved this book! I think the cover was really interesting. Everything on it symbolizes things that come in the book. I made no sense whatsoever and frankly, didn’t look so eye-catching at first. but I decided not to “judge it by its cover.” It was worth it. this was a great book. im only 12 but as soon as i started i couldn’t stop reading. the cover was confuseing at first but i had fun pieceing together the cover one bit at a time. I have read it for the third time and am still hooked. i would prefer though if it had pictures.